Given by Miss Davey in memory of her brother George Henry Davey. 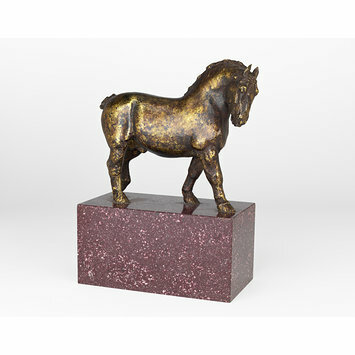 This gilt bronze Suffolk Punch Stallion is part of a larger series of twenty Champion animals. It is the work of Herbert Haseltine whose sculptures made use of beautiful materials and patinas and were inspired by Egyptian sculptures. The Stallion is Sudbourne Premier who won a number of prizes between 1921 and 1924. Statuette, gilt bronze. Suffolk Punch Stallion. BRITISH CHAMPION ANIMALS. THIRD SET. III. SUFFOLK PUNCH C. HASELTINE MCMXXV. Given by Miss Davey in memory of her brother, George Henry Davey. Given by Miss Davey in memory of her brother, George Henry Davey. Miss Davey's gift, A.193 to A.210-196 consists of eighteen objects representing nineteen animals as A.197-1969 represents two. The whole series originally consisted of 20 animals. George Henry Davey, who purchased the Third set of British Champion animals and in whose memory it was given to the Museum, was the Paris representative of Knoedler and Co, the art-dealers, for many years. Herbert Haseltine's idea of the series originated in his modelling of King George V's champion Shire stallion Field Marshall V (exhibited 1921). In June 1925 twenty of the British Champion Animals were shown in Paris at the Galerie Georges Petit. In July and August the same exhibition was held at Knoedler's in London; the titles corresponds with the Museum's set. This Suffolk Punch Stallion called Sudbourne Premier was foaled in 1919 (Sire, Sudbourne Beau Brocade, Dam, Sudbourne Moonlight. Bred by the late Rt Hon Lord Manton and the property since July 11th 1923 of Percy C. Vestey Esq, of Easton Park, Wickham Market, Suffolk. First and Champion at the Shows of the Royal Agricultural Society of England, 1921 and 1922. First and Champion at the Suffolk Show, 1922 and 1924. First and Champion at the Woodbride Show 1923, First and Champion and Victory Challenge Cup, Woodbridge, 1924, First at the Derby Show 1923, First at the Ipswich Spring Show, 1924, First at the Norwich Spring Show, 1924, First Suffolk Stallion, 1924, First at the Essex Show, 1924, First at the Norfolk Show. 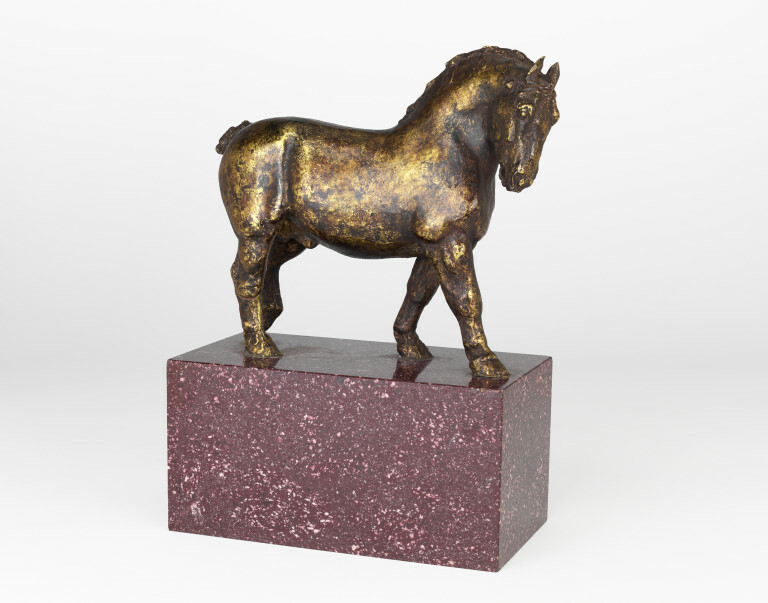 There is a bronze in the Luxembourg Museum and another in the Fine Arts Museum of San Francisco. Stover, D.L. American Sculpture: the Collection of the Fine Arts Museums of San Francisco., San Francisco, 1982, p. 55.